Manuel Pellegrini insists he has no concerns about the off-field tension which boiled over at West Ham last season. Supporters frustrated by poor performances and angry at the club’s move from Upton Park to the London Stadium invaded the pitch and demonstrated against the club’s board during the Hammers’ 3-0 home defeat to Burnley in March. Owners David Sullivan and David Gold have gone some way to appeasing those fans by shelling out almost £100million on seven new players this summer. And Pellegrini, who will be taking charge of the 14th club of his well-travelled career, says he will not shy away from the challenge. “I know what happened with the Burnley game. But fortunately for me I have never been afraid of anything in my life,” said the 64-year-old. “I hope we can build a project here. I will not fail. “I am sure that the fans will support the club because they are seeing that something is changing inside. 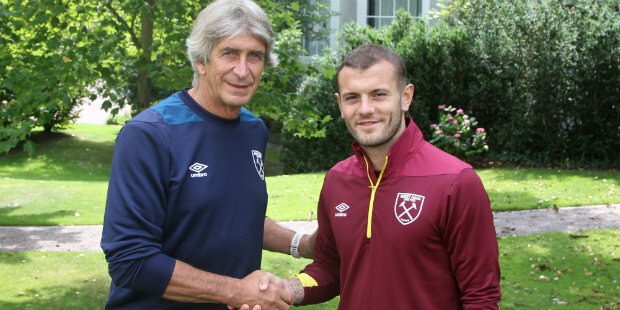 Felipe Anderson and Andriy Yarmolenko are West Ham’s marquee signings but Pellegrini faces another challenge in trying to keep another new arrival, Jack Wilshere, fit. The 26-year-old, who left Arsenal in the summer, has been plagued by injuries throughout his career. “Undoubtedly he had quite a few injuries in the past,” added Pellegrini. “But the season he played on loan at Bournemouth he played a lot of games. Last season he did not have too many injuries. We will try to keep him working in different ways to the rest of the squad. “We are doing a plan with the doctor with him and with the physical manager. Be the first to comment on "West Ham boss not worried about fans’ protests – or Wilshere’s fitness"